(Nanowerk News) Electric cars are very much welcomed in Norway and they are a common sight on the roads of the Scandinavian country – so much so that electric cars topped the list of new vehicle registrations for the second time. This poses a stark contrast to the situation in Germany, where electric vehicles claim only a small portion of the market. Of the 43 million cars on the roads in Germany, only a mere 8000 are electric powered. The main factors discouraging motorists in Germany from switching to electric vehicles are the high investments cost, their short driving ranges and the lack of charging stations. Another major obstacle en route to the mass acceptance of electric cars is the charging time involved. The minutes involved in refueling conventional cars are so many folds shorter that it makes the situation almost incomparable. However, the charging durations could be dramatically shortened with the inclusion of supercapacitors. These alternative energy storage devices are fast charging and can therefore better support the use of economical energy in electric cars. Taking traditional gasoline-powered vehicles for instance, the action of braking converts the kinetic energy into heat which is dissipated and unused. Per contra, generators on electric vehicles are able to tap into the kinetic energy by converting it into electricity for further usage. This electricity often comes in jolts and requires storage devices that can withstand high amount of energy input within a short period of time. In this example, supercapacitors with their capability in capturing and storing this converted energy in an instant fits in the picture wholly. Unlike batteries that offer limited charging/discharging rates, supercapacitors require only seconds to charge and can feed the electric power back into the air-conditioning systems, defogger, radio, etc. as required. Rapid energy storage devices are distinguished by their energy and power density characteristics – in other words, the amount of electrical energy the device can deliver with respect to its mass and within a given period of time. Supercapacitors are known to possess high power density, whereby large amounts of electrical energy can be provided or captured within short durations, albeit at a short-coming of low energy density. The amount of energy in which supercapacitors are able to store is generally about 10% that of electrochemical batteries (when the two devices of same weight are being compared). This is precisely where the challenge lies and what the ElectroGraph project is attempting to address. ElectroGraph is a project supported by the EU and its consortium consists of ten partners from both research institutes and industries. One of the main tasks of this project is to develop new types of supercapacitors with significantly improved energy storage capacities. In numerous tests, the researcher and his team investigated the nano-material graphene, whose extremely high specific surface area of up to 2,600 m2/g and high electrical conductivity practically cries out for use as an electrode material. It consists of an ultrathin monolayer lattice made of carbon atoms. When used as an electrode material, it greatly increases the surface area with the same amount of material. 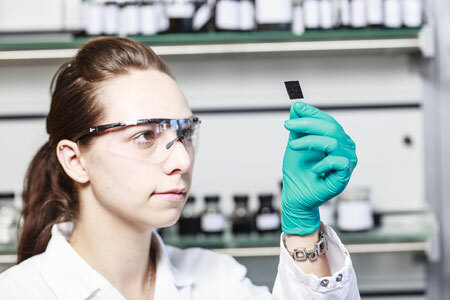 From this aspect, graphene is showing its potential in replacing activated carbon – the material that has been used in commercial supercapacitors to date – which has a specific surface area between 1000 and 1800 m2/g. By arranging the graphene layers in a manner that there is a gap between the individual layers, the researchers were able to establish a manufacturing method that efficiently uses the intrinsic surface area available of this nano-material. This prevents the individual graphene layers from restacking into graphite, which would reduce the storage surface and consequently the amount of energy storage capacity. In order to present the new technology, the ElectroGraph consortium developed a demonstrator consisting of supercapacitors installed in an automobile side-view mirror and charged by a solar cell in an energetically self-sufficient system. The demonstrator will be unveiled at the end of May during the dissemination workshop at Fraunhofer IPA."